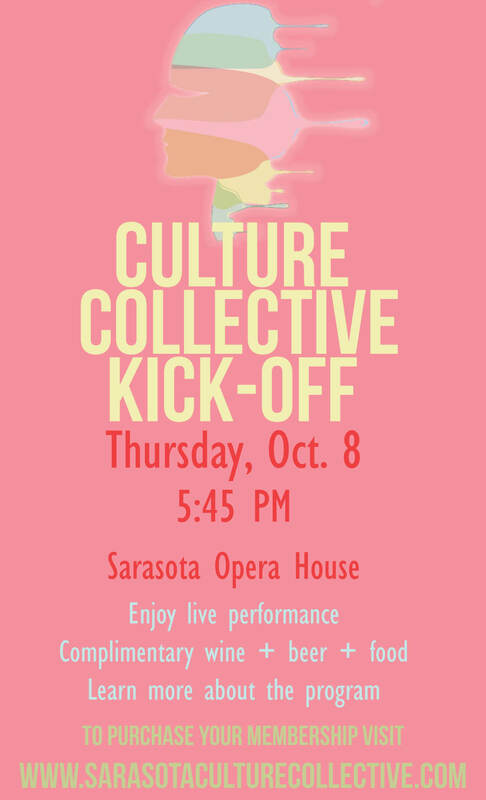 The Arts and Cultural Alliance of Sarasota County kicks off its 2015-2016 Culture Collective season on Thursday, Oct. 8. Here’s a great deal for young people who are interested in the arts but who don’t want to shell out big bucks for tickets to events and shows. For a $99 membership fee, the Sarasota Culture Collective gives people age 21-39 one ticket each to a performance at Asolo Repertory Theatre, Sarasota Ballet, the Circus Arts Conservatory, Sarasota Opera, Sarasota Orchestra and The Ringling. There are also pre- or post-show mixers that allow Culture Collective members the chance to enjoy cocktails and appetizers, as well as see a presentation given by a performer or director from the arts organization. The 2015-2016 season kicks off this Thursday, Oct. 8, at the Sarasota Opera House in downtown Sarasota; for more information and a list of this year’s performances, visit www.sarasotaculturecollective.com.